Definition at line 2048 of file DeclTemplate.h. Definition at line 2219 of file DeclTemplate.h. Definition at line 2220 of file DeclTemplate.h. Definition at line 2077 of file DeclTemplate.h. Definition at line 2083 of file DeclTemplate.h. Insert the specified partial specialization knowing that it is not already in. InsertPos must be obtained from findPartialSpecialization. Definition at line 408 of file DeclTemplate.cpp. Insert the specified specialization knowing that it is not already in. InsertPos must be obtained from findSpecialization. Definition at line 397 of file DeclTemplate.cpp. Definition at line 2235 of file DeclTemplate.h. Definition at line 2236 of file DeclTemplate.h. Create a class template node. Definition at line 342 of file DeclTemplate.cpp. References AdoptTemplateParameterList(), clang::C, and clang::TemplateDecl::setAssociatedConstraints(). Create an empty class template node. Definition at line 362 of file DeclTemplate.cpp. Return the partial specialization with the provided arguments if it exists, otherwise return the insertion point. Definition at line 403 of file DeclTemplate.cpp. Referenced by clang::Sema::ActOnClassTemplateSpecialization(), clang::TemplateDeclInstantiator::InstantiateClassTemplatePartialSpecialization(), and clang::ASTNodeImporter::VisitClassTemplateSpecializationDecl(). Find a class template partial specialization with the given type T.
T a dependent type that names a specialization of this class template. the class template partial specialization that exactly matches the type T, or nullptr if no such partial specialization exists. Definition at line 435 of file DeclTemplate.cpp. Find a class template partial specialization which was instantiated from the given member partial specialization. D a member class template partial specialization. 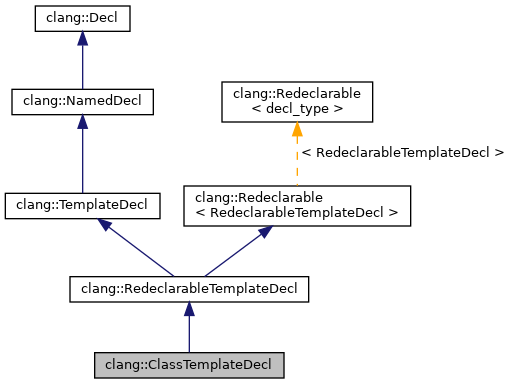 the class template partial specialization which was instantiated from the given member partial specialization, or nullptr if no such partial specialization exists. Definition at line 447 of file DeclTemplate.cpp. Return the specialization with the provided arguments if it exists, otherwise return the insertion point. Definition at line 392 of file DeclTemplate.cpp. Referenced by clang::Sema::ActOnClassTemplateSpecialization(), and clang::ASTNodeImporter::VisitClassTemplateSpecializationDecl(). Definition at line 2133 of file DeclTemplate.h. Referenced by clang::Sema::FindInstantiatedDecl(), isInstantiationOf(), clang::Sema::isStdInitializerList(), and clang::ASTDeclWriter::VisitClassTemplateSpecializationDecl(). Definition at line 2137 of file DeclTemplate.h. Definition at line 2090 of file DeclTemplate.h. Retrieve the template specialization type of the injected-class-name for this class template. typedef array this_type; // "array" is equivalent to "array<T, N>"
Definition at line 459 of file DeclTemplate.cpp. Referenced by clang::TemplateDeclInstantiator::InstantiateEnumDefinition(), clang::Sema::isMoreSpecializedThanPrimary(), and clang::ASTDeclReader::VisitClassTemplateDecl(). Definition at line 2162 of file DeclTemplate.h. Definition at line 2154 of file DeclTemplate.h. Definition at line 2158 of file DeclTemplate.h. Retrieve the set of partial specializations of this class template. Definition at line 379 of file DeclTemplate.cpp. Retrieve the partial specializations as an ordered list. Definition at line 424 of file DeclTemplate.cpp. Retrieve the previous declaration of this class template, or nullptr if no such declaration exists. Definition at line 2144 of file DeclTemplate.h. Definition at line 2148 of file DeclTemplate.h. Retrieve the set of specializations of this class template. Definition at line 373 of file DeclTemplate.cpp. Get the underlying class declarations of the template. Definition at line 2102 of file DeclTemplate.h. Referenced by clang::Sema::ActOnClassTemplateSpecialization(), clang::Sema::ActOnExplicitInstantiation(), getExternalLinkageFor(), clang::TemplateDeclInstantiator::InstantiateEnumDefinition(), clang::Sema::isStdInitializerList(), clang::Sema::propagateDLLAttrToBaseClassTemplate(), and clang::ASTDeclReader::VisitClassTemplateDecl(). Returns whether this template declaration defines the primary class pattern. Definition at line 2108 of file DeclTemplate.h. Load any lazily-loaded specializations from the external source. Definition at line 368 of file DeclTemplate.cpp. Definition at line 385 of file DeclTemplate.cpp. Definition at line 2226 of file DeclTemplate.h. Definition at line 2230 of file DeclTemplate.h. Definition at line 2222 of file DeclTemplate.h. Definition at line 2095 of file DeclTemplate.h. Definition at line 2096 of file DeclTemplate.h.